Solar Charge Controller is one of important part when you purchase a solar home installation with battery backup. Solar panels produce direct current, meaning the electricity from the panels flows in only one direction. They must do, as they cannot produce any other form of current. This current is passed to both the charge controller to top up the batteries and operate household items or to the inverter, to pump electricity into the grid if there is excess. The quality of the charge controller will directly affect the life of the backup batteries. This is due to the particular chemistry involved in the depletion and recharging of the Lead Acid Accumulator batteries. When the battery is depleted of charge, the lead plates inside the battery are corroded. It is this corrosion that provides the electricity. When the battery is recharged, the plates are rebuilt, the opposite of the depleting reaction. Sufficient charge delivered in the right volumes at the right time will allow the terminal plates inside the battery to be restored to as close to their previous condition as possible. This happens through growth of metal crystals on the surface of the plate. If this crystal growth does not happen at the optimum rate to generate large stable crystals, chunks of the metal will drop off the plate and build up at the base of the battery. This is the cause of the slow degeneration of car and other types of lead acid batteries. Lead Acid Accumulator batteries are expensive and also contain a great deal of material and so have a high manufacturing energy. Selecting a good quality charge controller will maximize the life of these batteries in a solar home system. Buying a cheaper controller will result in shorter battery life and a greater long term cost as you will need to replace the batteries sooner than you should. Then, unless you want the same thing to happen, you will also need to replace the charge controller. 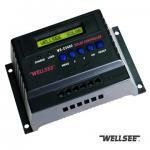 Purchasing a good quality charge controller will give you peace of mind and greater savings in the long term. Solar charge controller/regulator with MPPT (Maximum power point tracking) is a technology which is specifically designed to work with almost all the photovoltaic modules. Of course, it is for the solar systems where module voltages are higher then the battery voltages. It is an electronic system that helps the solar module produce all the power that they are capable of. However, it is not the mechanical tracking system that physically moves the modules towards the sun’s direction to convert more sun energy to electrical energy. Check out the functions of a normal PV regulator. It monitors the battery charging and gives them the protection from getting overcharged or undercharged. We connect the regulator directly to the battery and then to the solar module. A good quality MPPT charge controller calculates the voltage at which the module can produce maximum power as per its capability. Efficiency of most of the MPPT charge controller is between 93 to 96 percent. A MPPT charge controller is useful in winters and on cloudy days when there is virtually no sunshine. This is the time when more power is required to charge the battery to maintain the SOC level. A MPPT solar regulator can be a beautiful combination with a grid-tied solar module. Other advantage of a MPPT solar regulator is that you save a lot in the wiring expenses, which means that a smaller gauge wiring can be used. a) Voltage & current regulation, PWM (Pulse width modulation) control, current compensation load disconnection, automatic load reconnection, and temperature compensation. b) Electronic Protection:- Over charging protection, deep discharging protection, reverse polarity protection from the module side and from battery side. Reverse polarity protection from internal fuse, short circuit protection, and over voltage protection at module input. Also make sure that there is open circuit protection without battery, over temperature and over load protection, and battery over voltage shutdown. In any applications which PV module is energy source, MPPT solar controller is used to correct for detecting the variations in the current-voltage characteristics of solar cell and shown by I-V curve. MPPT solar controller is necessary for any solar power systems need to extract maximum power from PV module; it forces PV module to operate at voltage close to maximum power point to draw maximum available power. MPPT solar controller allows users to use PV module with a higher voltage output than operating voltage of battery system. For example, if PV module has to be placed far away from charge controller and battery, its wire size must be very large to reduce voltage drop. With a MPPT solar controller, users can wire PV module for 24 or 48 V (depending on charge controller and PV modules) and bring power into 12 or 24 V battery system. This means it reduces the wire size needed while retaining full output of PV module. 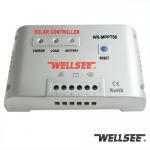 MPPT solar controller reduces complexity of system while output of system is high efficiency. Additionally, it can be applied to use with more energy sources. Since PV output power is used to control DC-DC converter directly. MPPT solar controller can be applied to other renewable energy sources such as small water turbines, wind-power turbines, etc.